Navy video shows migrant rescue Jump to media player More than 40 migrants have died in the Mediterranean but many were saved, as an overcrowded boat was intercepted off Libya, the Italian navy says. Cameron defends 'swarm' comment Jump to media player One hundred days since the Conservatives won the general election Prime Minister David Cameron defends the government's handling of the Calais migrant crisis. Ferry to ease Kos migrant crisis Jump to media player A ferry arrives in Kos to act as a registration centre for some of the thousands of migrants arriving on the Greek island. 'British smugglers' trafficking migrants Jump to media player Authorities in northern France tell the BBC that British smugglers are among those trafficking migrants to the UK. 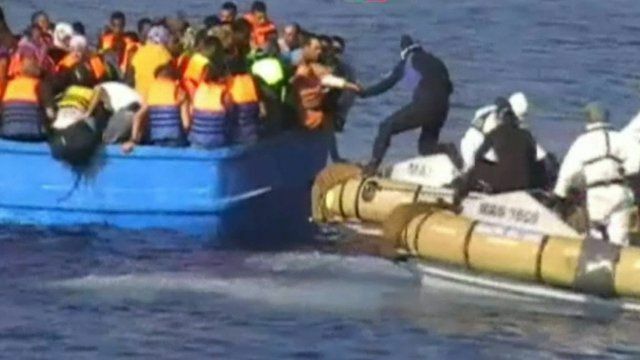 Dramatic airlift of migrants at sea Jump to media player The Italian Navy has released video footage showing the dramatic rescue of dozens of migrants off the coast of Libya. Trafficking suspects held in Italy raids Jump to media player Five people are arrested in Sicily, accused of multiple homicide and human trafficking, following the drowning of more than 200 migrants in the Mediterranean. More than 40 migrants have died in an overcrowded boat in the Mediterranean, the Italian navy has said. Many others were saved as the boat was intercepted off Libya. The navy said the rescue was continuing. The deaths were caused by suffocation as the migrants were held in a confined space below deck, reports say. European officials say the plight of migrants, 250,000 of whom have crossed by boat to the continent this year, is "beyond urgent".